Saint Petersburg is one of the world’s most beautiful cities. It was built on a collection of islands where the Neva River meets the Gulf of Finland and is divided further by a system of canals earning the city the name the Venice of the North. 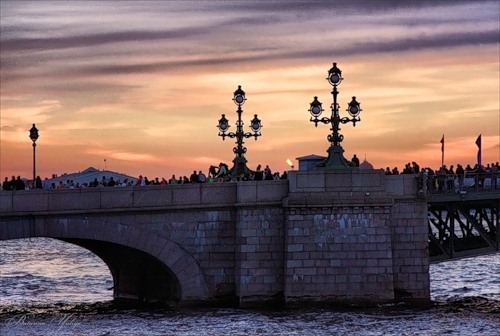 St. Petersburg was referred to as Peter the Great’s Window to the West as the great Tsar and reformer Peter the First designed the city to be Russia’s most European. The European feeling of the city is as true today as it was during the early 1700s. The embankments and boulevards are full of 18th and 19th century palaces of the nobility giving St. Petersburg an almost fairytale atmosphere. The historical city center is huge and dominated by the Winter Palace (former residence of the Tsars) which now houses the world famous Hermitage Museum. St. Petersburg Russia indeed is one of the most romantic and beautiful cities on earth. The city has witnessed some of the most dramatic and important moments in Russian history since it’s founding in 1703 by Peter the Great, making the city especially important for Russian tourism. St. Petersburg was the scene of the Decembrist uprising, the famous court of Tsarina Catherine the Great, the assassination of Tsar Pavel and Alexander II and the home of Rasputin, the Siberian mystic. The last Tsar, Nicholas the II, was overthrown at the Winter Palace and the 1917 Bolshevik Revolution and Lenin brought communism to power here. After the revolution, the name of the city was changed to Leningrad. During the Second World War, Leningrad was under siege and fully blockaded by the Nazis for almost 3 years, resulting in the deaths of up to 1.5 million of its citizens. Our St. Petersburg tours take you to the places associated with many of these events and more.